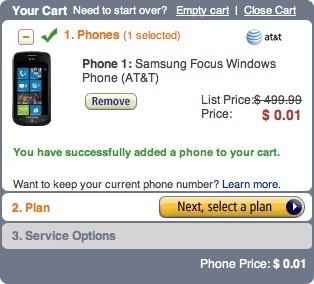 Amazon is having one of their periodic penny smartphone sales, and have discounted all three AT&T WP7 phones down to just one cent. The Samsung Focus, LG Quantum, and HTC Surround are all as cheap as possible with you still giving someone money for them. This deal runs through January 17th, so you have a few days to mull over it. Since AT&T didn’t announce any new WP7 devices at CES, this is a perfectly good opportunity to pick up one of three amazing devices for an extremely good price. It doesn’t look like we’ll see any major new additions to the world of WP7 handsets until the CDMA versions arrive in the next six months or so.